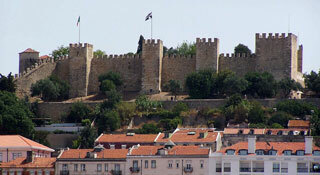 São Jorge Castle (Saint George Castle) is a Moorish castle occupying a commanding hilltop overlooking the historic centre of the Portuguese city of Lisbon and Tagus River. The strongly fortified citadel dates from medieval period of Portuguese history, and is one of the main tourist sites of Lisbon. This article uses material from the Wikipedia article "São Jorge Castle", which is released under the Creative Commons Attribution-Share-Alike 3.0 License.